Roy Edgar Pelton died of cavernous sinus thrombosis in Toronto General Hospital on this day in 1918 (although some sources say he died on April 15th). Pelton was serving as a cadet with the Royal Flying Corps’ 42nd Wing, based in Deseronto. He had originally enlisted in the Canadian Expeditionary Force in Vancouver on January 25th, 1917 and had served in the Canadian Army Service Corps for eight months with the regimental number 200223. He joined the Royal Flying Corps in Winnipeg on November 13th, 1917 (number 153779) and was officially appointed to Corps on January 13th, 1918 in Toronto. He was five feet four and a half inches tall, with a dark complexion, black hair and blue eyes. He would have spent the winter training in Texas with the rest of 42nd Wing, and must have fallen ill on his return to Ontario in April 1918: his death registration notes that he had been ill for two weeks. Initially his death was recorded on his Royal Flying Corps record as a flying accident in Texas. This was later crossed out and replaced with the correct information. Roy was born in Grandview, Manitoba on July 10th, 1896 (other sources say October 7th), the son of Hiram Whitney Pelton and Edith Abigail (née Powell). Between 1901 and 1911 the family moved from Manitoba to British Columbia: Pelton gave his home address as 833 Pacific Street, Vancouver. 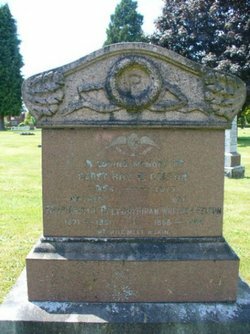 Pelton was buried in Mountain View Cemetery, Vancouver.